A year ago, sitting in the doctor's office, Gregory MacNeill didn't know if he would be able to compete again. The doctors didn't know either. "I remember they asked me, 'what do you want in life'," MacNeill recalled recently. " 'We can't guarantee that you'll be able to compete at a high level again' is what the doctors said. It was an injury that they have rarely ever seen before." Five days earlier, the then-University of Toronto student ruptured two adductor tendons while competing in the final of the 60-metre hurdles at the 2016 U SPORTS Track and Field Championships at York University. Following a successful rehab stint in the offseason with coaches Carl Georgevski and Bob Westman at U of T as well as physiotherapist Jason Meehan (who MacNeill credits for his recovery), the 2015 U SPORTS 60m hurdles champion felt he still had something to prove to himself. Now in his fifth year of eligibility, MacNeill is going through his first year as a member of the Gryphons track and field team and headed to this weekend's U SPORTS Track and Field Championships at the University of Alberta in Edmonton. After spending the last three years as a member of the Toronto Varsity Blues, MacNeill moved to Guelph to pursue his Master's degree in Management. "It's one of those things when you work so hard, I was fortunate enough that this opportunity came up at Guelph to do my Master's and it worked out perfect that I was able to proceed in my life both academically and athletically," said MacNeill, who turns 25 in April. Overcoming adversity wasn't new to MacNeill, who was diagnosed with Type 1 diabetes at the age of nine but overcame that medical hurdle to set track records in high school and collect a bronze medal at the world youth under-18 athletics championships. MacNeil's diligence in rehabbing from his adductor injury paid off when he made his season debut at the Toronto Track and Field Centre at York University on Feb. 3, running the 60 hurdles in 8.14 seconds – more than meeting the qualifying standard for this U SPORTS championships. MacNeill continued his comeback the following week when Guelph travelled to Geneva, Ohio, to compete at the Spire Division 1 Invitational meet. There, MacNeill, Graeme Thompson, Thomas Land, and Brandon Shirk set a U SPORTS record in the 4x400-metre relay, running in a time of 3:10.83. An outstanding result, but for MacNeill – who ran the 400 metres for Canada at the 2015 Pan Am Games in Toronto – he was simply happy to be competing at a high level once again. "I ran the 60 hurdles race and it was more of a mental block than a physical one," he said. "For the relay, when we sat down in August, it was one of our goals to break the record. Spire was the first time we ran together as a relay team, and for the boys to go there and run like that is a pretty cool experience." MacNeill isn't alone on a very strong Gryphons team this season, but he's brought more than his talent. He's been a leader with his new team, much to the delight of Gryphons coach Jason Kerr. "He's brought a cultural fabric of performance and commitment to excellence," Kerr said. "For a lot of the younger athletes, it may be needed to have someone to look up to in terms of lifestyle, cultural commitment, camaraderie, I think he [MacNeill] became a figure that a lot of people looked up to and it changed the entire culture of the group." 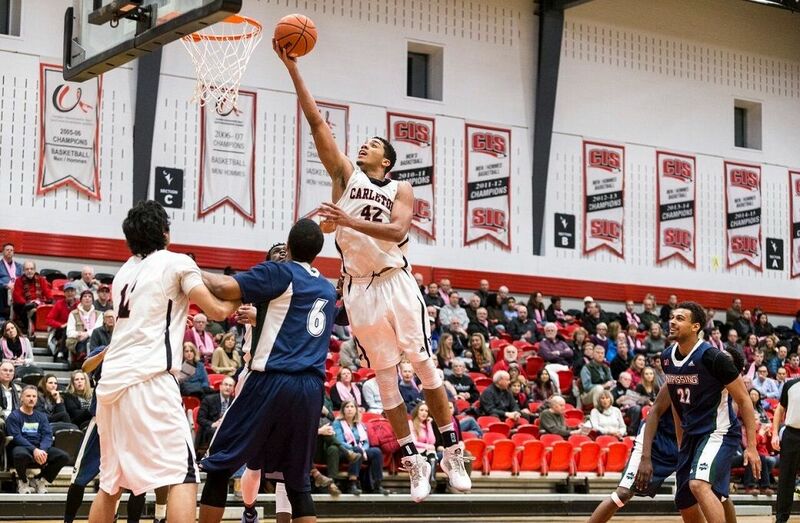 At the OUA Championships, MacNeill did just that. 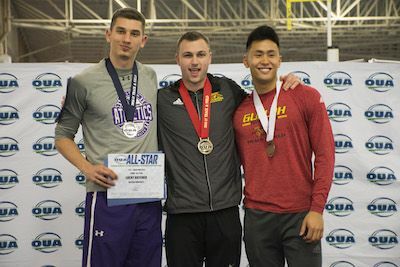 He led the Gryphons to an OUA Conference Championship, capturing gold in the 60m hurdles in 8.05 seconds, the fastest time among U SPORTS hurdlers this season. As the U SPORTS Track and Field Championships quickly approaches, MacNeill remains focused. On every race day, he posts on Twitter, "Clear eyes, full hearts, can't lose". It's something he's done for almost three years now. When asked about his race day motto, MacNeill said smiling, "Trust your training, be focused, give everything your body has, and leave it all on the track. If I can do that, regardless of the result, I can't lose the race."